The fee charged for cutting any board of wood, MDF or PVC one way at any length. The sheets or panels will be cut square as per your instructions. Accuracy will be within 1/8” of an inch. Cut offs or waste will be shipped with your order unless specified otherwise. If you do not see a specific item that you are looking for listed, contact us and at no additional charge and we can send other related samples like: Beaded, V-Grooved or Nickel Gap Sheets or Panels. 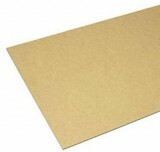 One sheet of Raw MDF. Being popular, we carry lots of stock for fast shipping. MDF sheets are produced with a state-of-the-art systems resulting in better consistency that allows for higher quality fabrications. Custom Milled, Choose from a wide variety of groove spacing and board thicknesses, Elite Trimworks offers MDF Grooved Sheets which can be used for Back Splashes, Cabinet Doors, Furniture, Ceilings or Wall Applications. Our V-Grooved Sheets can be ordered in panel thicknesses from 1/8" to 2" thick and the grooves can be 2", 3", 4", or 6" on center. Our most common spacing is 4" on centre. Using the predetermined spacing insures that the beads lineup end to end for seamless wall applications. You may choose between vertical or horizontal run grooves. The Antique "V" Groove is approximately 7/32" wide and 7/64" deep, which gives a "Wide Plank" appearance. We can groove sheets up to 5’ wide and either 2, 3, 4, 6, 8, 10, or 12ft long, between 3/8" to 2” thick. 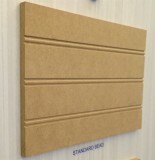 Custom Milled, Choose from a wide variety of spacing and board thicknesses, Elite Trimworks offers MDF Channel Grooved Sheets which can be used for Walls, Ceilings or Cabinet Applications. Our Channel Bead, Nickel Gap or "U" Channel Sheets can be ordered in panel thicknesses from 3/8" to 2" thick and the grooves can be 4", 6" or 8" on center. Our most common spacing is 6" on centre. Using the predetermined spacing insures that the beads lineup end to end for seamless wall applications. You may choose between vertical or horizontal run grooves. The Antique "U" Groove is approximately 1/4" wide and 3/16" deep, which gives a Plank or Board appearance. Standard Beaded Sheet which can be used for Ceilings, Wall Applications. You may choose bead spacing from 2" to 6" wide on center. Using the predetermined spacing insures that the beads lineup end to end for seamless wall applications. We can make these beaded sheets up to 4’ wide and either 6, 8, 10, or 12ft long, and from 1 ⅜" to 1 ½” thick. W-Beaded Sheet which can be used for Ceilings, Wall Applications. You may choose your spacing from 2" to 6" on center. Using the predetermined spacing insures that the beads lineup end to end for seamless wall applications.